In his one-man show “Dishwasher Dreams,” actor and writer Aladdin Ullah draws on the story of his father, Habib (pictured in the suit and fedora in the upper corner of this page), a steamship worker from the region of Noahkali, East Bengal, who jumped ship and made his way to New York’s Lower East Side in the 1920s, settled in Harlem in the 1930s, worked for years as a dishwasher and line-cook in downtown restaurants, and for a time in the late 1940s ran one of the city’s earliest Indian restaurants just off Broadway in Manhattan’s theater district. 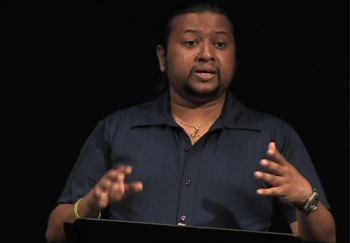 In his performance, Aladdin explores his father’s life and experiences in Spanish Harlem in the 1940s, 50s, and 60s, as well as his own childhood in the 1970s and 80s, growing up with his family in East Harlem’s Washington Carver projects as his father’s generation of uptown Bengali immigrants died away and vanished from memory. — READ Aarti Virani’s article about Aladdin and his one-man show on the Wall Steet Journal‘s India Realtime. Donate/Book a performance: “Dishwasher Dreams” was developed under the name “Indio” through the Joseph Papp Public Theaters’ Emerging Writers’ Program in 2010-11. Ullah is currently raising funds to produce the one-man show Off Broadway in New York City. Please help bring this important work to the public by making donation to the performance’s production fund or hosting a performance of “Dishwasher Dreams” in your city or on your campus. Contact: funnyaladdin[at]gmail[dot]com.